Many people think dandelion is only a humble garden weed, because they don’t know about these important health benefits of dandelion. Its leaves and flowers have healing and nutritional properties. Dandelion is found all over the world, so everybody can enjoy the beauty and health benefits of dandelion leaves. 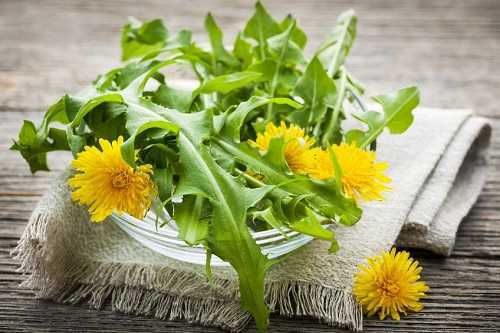 Dandelion is often used in salads and has more protein per serving than spinach. Its leaves are rich in calcium, iron, magnesium, phosphorus, potassium and manganese and vitamins A, C, E, K, B1, B2, and B6. Its root contains calcium, iron, potassium, sulphur, silicon, magnesium, chlorophyll and phosphorus. Read on to learn some of the most wonderful health benefits of dandelion. Skin diseases caused by fungal or microbial infections can be treated with dandelion sap (dandelion milk). The sap has germicidal, insecticidal, and fungicidal properties and it’s also highly alkaline. All these make dandelion a good treat for ringworm, eczema and other itchy complaints. Another great health benefit of dandelion is that it stimulates the pancreas to produce insulin. Since dandelion is a natural diuretic it causes more frequent urination, which helps remove excess sugar from the body and lower sugar build up in the kidneys, preventing renal disease that most diabetics are susceptible to. The world’s ancient traditional medicine systems, including the Native American, Arabian and Chinese, have long known about the health benefits of dandelion. One of the most important benefits is that dandelion has anti-cancer effects; it helps to fight breast and prostate cancers. Studies show that its root has a great impact on cancer cells (melanoma) that are resistant to chemotherapy, without harming the healthy cells. Dandelion is rich in calcium, which is essential for the growth and strength of bones. It also has a high concentration of antioxidants such as Vitamin C and Luteolin, which protect bones from toxic free radicals that can cause general bone weakening, loss of density and premature aging. Dandelion improves the function of the liver by stimulating the liver naturally and promoting digestion. The chemicals in dandelion eliminate toxins from the body and help to rebalance electrolytes and reestablish hydration. You don’t need to eat dandelion flowers or leaves, though. You can add some leaves to your green smoothie or vegetable salad. This way, you won’t notice its taste, but will reap all its benefits. Dandelion is a mild appetite stimulant, so if you are trying to lose weight, perhaps, it’s better to avoid it. But if you want to improve your digestive health, dandelion is something you need! The inulin and mucilage in the plant have soothing effects on the digestive tract and powerful antioxidants help with the absorption of the toxins from food and encourage the growth of friendly gut bacteria, and inhibit and discourage unfriendly gut bacteria and flora. Due to its diuretic properties, dandelion promotes good urinary health. Yes, that’s true! The detoxification cleanses your kidneys as well as urinary tract, while microbiological growths in the entire urinary system are inhibited by the disinfectant properties of dandelion. If you’re going to take advantage of these amazing properties, be sure to make a small research and learn how to use it. There are many different dandelion products available in drug stores and health food stores, but it’s better to harvest your own. Ask your doctor if you can incorporate dandelion into your diet to make sure you can eat it. Do you use dandelion in your diet? Do you know any other important health benefits of this fantastic plant? Please comment below and thanks for reading!